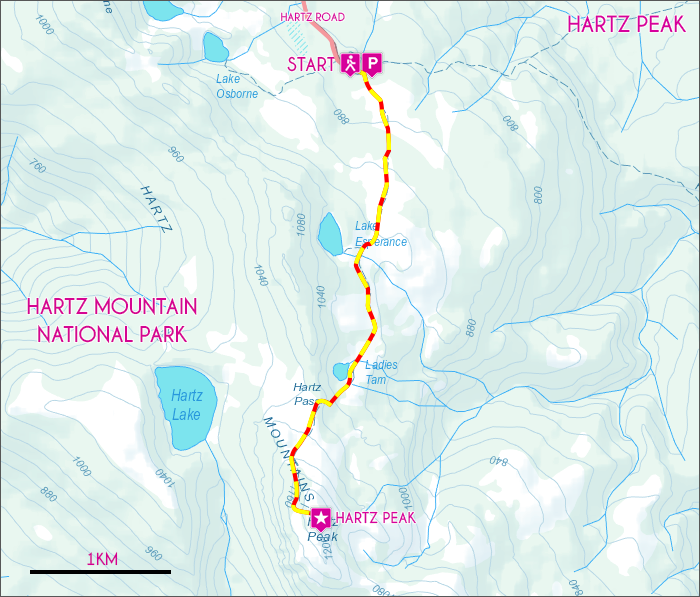 View Google Map Directions Hartz Peak is within the Hartz Mountain National Park – located 84km south-west of Hobart. From Hobart drive south via the Southern Outlet and join onto the Huon Highway (A6), follow the signs through Huonville to Geeveston. Once in Geeveston turn right onto Arve Road (C632), at this point there should be a sign post directing you to Hartz Mountain. Follow this road for 12km before turning left. From here it is a steady climb until you reach the park and the beginning of the Hartz Peak track. From the car park the start of the Hartz Peak track is clearly marked near the visitors’ shelter. The walk begins with few hundred metres of gradual climbing through scrubby bushland over rocky steps before opening up into the heathland. As you establish yourself on the heathland a beautiful view of D’Entrecasteaus Channel appears behind you, with Mt Wellington further off to the north. You can see Hartz Peak further south of you. The track at this section is well constructed timber boarding, supporting you above the trickle of water running below you. 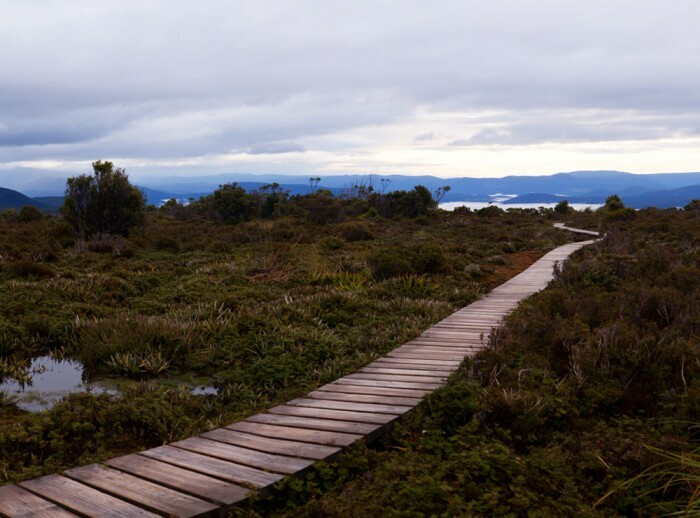 At the 1.5km mark there will be a side track to your right directing you to Lake Esperance, only 100 meters away. The track takes you to the glacier formed lake’s edge where seats are available. Once back on the main track continue south for another 1km over some easy ground until reaching Ladies Tarn on your right. 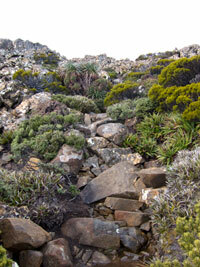 From here the track climbs a steep but short ascent of roughly 100 meters to the saddle below Hartz Peak. 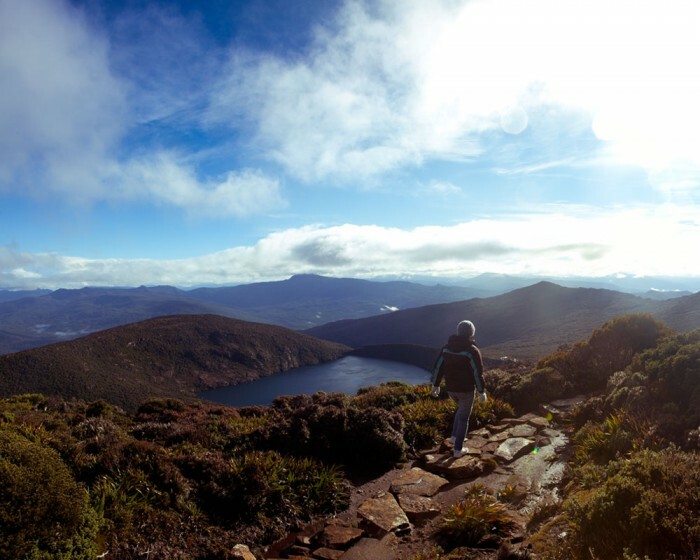 Further west below you, you can see Hartz Lake, which can be accessed taking the right hand turnoff along the cairn marked track (1.5km return from here). Hartz Peak is to our left; following cairns for 500 meters over a slight climb before a final steep climb over a rock scree to the summit. The final climb is marked by number of different cairn routes joining with each other at different sections. At the top enjoy fantastic views in all directions, including Federation Peak, that is, if the peak isn’t blanketed in fog (in which case you won’t see much, but the ambiance is still incredible). Even in heavy fog I have thoroughly enjoyed this walk, the well-marked trail provides a steady path to the top. It can get extremely windy and cold on the higher sections of this walk in bad weather so be sure to pack appropriately. The track may also be slightly under water in segments after heavy rain. Viability can also be drastically reduced in thick fog.